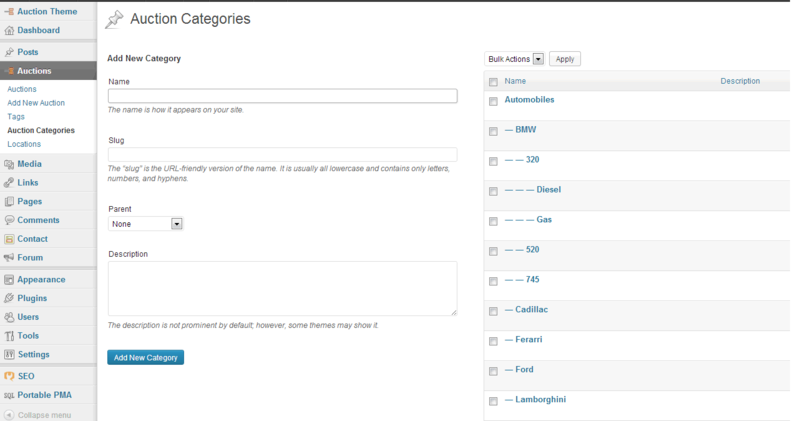 Adding categories to your auction listings is very simple thing to do. All you have to do is going to backend wordpress, then Auctions menu, then Categories. You can see a visual of where this menu is placed in the screenshot below. Also the Locations can be added with the similar process. See Locations for this. This page will briefly explain how you can add your own logo and replace the standard logo of the AuctionTheme. The process is simple and all you have to do is to follow the few steps explained below. First you have to get to the wp-admin area and to the AuctionTheme Menu, in the main left hand menu. Also the size of the logo can be anything you want, as long as the width is not bigger than 950 pixels. Go to wp-admin menu, in the backend area of your website. Go to Media menu, and upload your logo, then copy the new uploaded file/logo. Click on the AuctionTheme menu, then go to Layout Settings sub menu. Go to the Header tab and paste the image/logo url you just uploaded and save. This page will briefly explain how you can add your own logo and replace the standard logo of the ProjectTheme Theme. The process is simple and all you have to do is to follow the few steps explained below. First you have to get to the wp-admin area and to the ProjectTheme Menu, in the main left hand menu. Also the size of the logo can be anything you want, as long as the width is not bigger than 950 pixels (width). Click on the ProjectTheme menu, then go to Layout Settings sub menu. Adding categories to your products is very simple thing to do. All you have to do is going to backend wordpress, then Products menu, then Categories. You can see a visual of where this menu is placed in the screenshot below. Also the shop categories will be added at the same time automatically, and you dont need to bother about that. This page will show all our previous versions of walleto theme. Also you can see what has improved from each update, and see a list of modified files, in case you need it when upgrading. See below the list of available and current versions. This page will show you the most important hooks and actions you can use to modify and enhance the Walleto theme, to your liking. We have left a lot of hooks around the theme, which respect the main WordPress guidelines, and will make your life easier when modifying the theme. We really suggest using a child theme when doing mods, so when we launch a new update of the theme your changes will not be removed. This page will briefly explain how you can add your own logo and replace the standard logo of the Walleto Theme. The process is simple and all you have to do is to follow the few steps explained below. First you have to get to the wp-admin area and to the Walleto Menu, in the main left hand menu. Also the size of the logo can be anything you want, as long as the width is not bigger than 950 pixels (width). Click on the Walleto menu, then go to Layout Settings sub menu. On this page you will find some basic information on how you can modify the Buzzler theme. We are trying to provide some basic information, but for more advanced changes you will need to either go on the forum and ask there, or you can contact us directly. 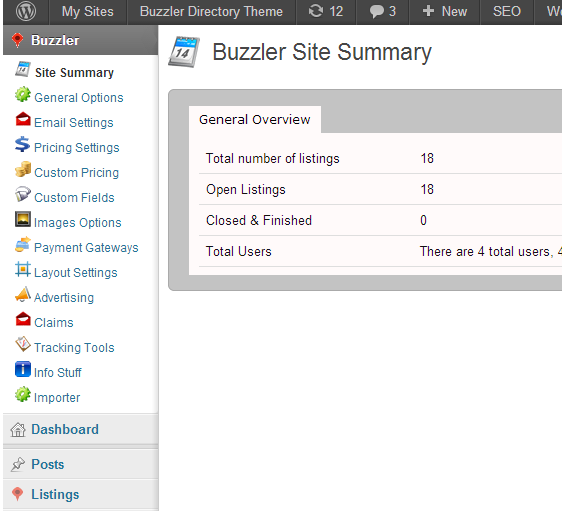 This page will briefly explain how you can add your own logo and replace the standard logo of the Buzzler Theme. The process is simple and all you have to do is to follow the few steps explained below. First you have to get to the wp-admin area and to the Buzzler Menu, in the main left hand menu. Also the size of the logo can be anything you want, as long as the width is not bigger than 950 pixels. Click on the Buzzler menu, then go to Layout Settings sub menu. This post will describe you the various functions that are present in the Buzzler Theme main menu. The menu is located in the wp admin area, at the top most position of the left hand menu (right hand for arabic wordpress). You can see below the main menu look, and explore the various functions. In this menu you will find some super basic information about the number of the listings in your website, the number of registered users, the closed and active listings, and also is reserved for future more sophisticated info, which we plan to add in the future, or whatever we can think of for the next update. In this main menu you will find a lot of settings that concern the basic functioning of Buzzler theme. You will find settings for the main menu slider, for the listing periods, for the admin approval of listings, and many others. A more detailed explanation will be found in the actual menu itself, where each menu item, has a question mark icon, and hovering your mouse on it will bring a short description about what that setting does. This menu item, is pretty much self explanatory. You will find here all the various email templates: for users signing up, for posting a listing, and others. All these templates can be translated and they also come with basic shortcodes, so you can put the variables (like username, listing title, links) wherever you want in the actual text template of the email thats getting sent. On the Pricing Settings page, you will find the settings for changing the site’s currency (our theme supports the most important currencies) and also a few settings, about the decimal separator (comma or point) and other settings. You can define custom fields here for your listings. For example if you have a restaurant website, you can add a Yes/No field for WiFi Internet or anything like that. These fields will appear in the listings page and also in the advanced search page.